This page is dedicated to Interest Only Mortgage Advice and hopefully the concept of how this type of mortgage works in the real world will become clear to all of our readers and help you decide if an Interest Only Mortgage is for you. KPM Financial Services has some of the Best Interest Only Mortgages throughout the industry. An Interest Only Mortgage basically will allow the borrower to make the interest portion of the mortgage back to the lender, the term will be decided between the Mortgage Company, the borrower and possibly an Independent Mortgage Broker this means that the monthly mortgage payments will be low due to the fact that only the interest is coming of the debt. If they decided to switch back to a full repayment mortgage there would be a significant increase in their monthly payments, please look at our repayment page to find out the facts behind a repayment mortgage. Also if you are thinking about taking out or Switching To Interest Only Mortgage make sure you get Independent Mortgage Advice at all times as these mortgages carry very high risks. If you have opted for Interest Only Mortgage Deals for the full term of the mortgage it would be prudent to have in place a Repayment Vehicles For Interest Only Mortgages this could be in the form of private pensions, ISAs and son on, the lender will expect you to ensure you have the means of paying off the mortgage once the term has expired. It is your responsibility to ensure the Repayment Vehicles For Interest Only Mortgages are on target to pay the mortgage off, not the mortgage lenders. You must remeber that if you opt for an Interest Only Mortgage UK at the end of the term the lender will still wnat back the amount they loaned you at the start of your mortgage. If you wanted to you could actually fix the rate of interest which will be applied to your mortgage for a given period of time, the terms are ususally 2, 3, 5, 7 and 10 years, this will vary from lender to lender. The benefit of this is that the Interest Only Mortgage Repayments will be fixed for that given period of time. Let KPM Financial Services Compare Interest Only Mortgaes for you, we will make sure that if you opt for an Interest Only Mortgage it will be suitable for your financial circumstances and thats a fact. You will have to use a Level Term Mortgage Protection Policy, which basically means that if and when you need to use this protection policy the whole of the mortgage will be paid off in full. This policy can be arranged on a death only basis or with Critical illness integrated into the policy. The difference been the death only will only pay out on death and the Critical Illness will pay out and a specified critical illness look at your policy to see what critical illnesses encompass your policy. 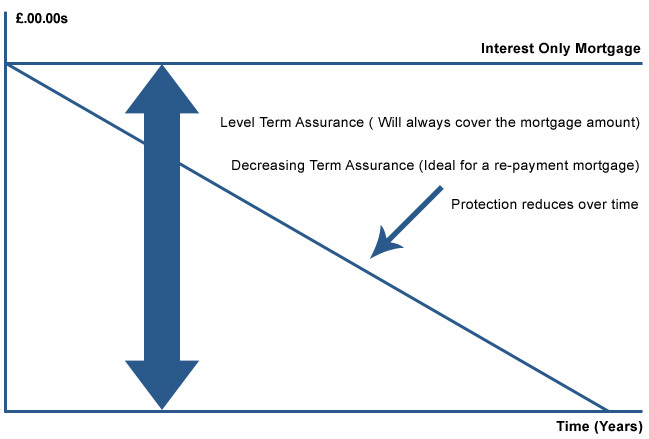 Do not in under any circumstances use a Decreasing term assurance policy due to premium, yes they are cheaper than a Level term but they will pay out a portion of the mortgage this is dependent upon when the claim is made, in the early years the amount would be large but in the later years the amount would be small.